London broil is one of those cuts of meat that cries out for seasoning and marinade. When you cook it and season it right it can be a great meal at a very reasonable price. Leave it plain and overcook it and you might as well just eat a sneaker. I had picked up a London broil on sale recently and decided to make it for dinner last night using this recipe I picked up from Food Network. All that’s really required is the time to let the meat sit in the marinade; the cooking time itself is only about 15 minutes. Prepare the steak: Pour the beef broth into a medium bowl and whisk in 2 tablespoons of the olive oil, the soy sauce, Worcestershire sauce, lemon juice, 1 teaspoon of salt and 1/2 teaspoon of pepper. Place the steak in a large resealable plastic bag, pour in the marinade and seal, squeezing out the air. Refrigerate the steak for at least 4 hours and up to 1 day. Prepare the herb butter: Mix the butter with the chives, parsley, tarragon, a pinch of salt, 1/2 teaspoon of pepper and the lemon juice in a bowl. About 30 minutes before cooking, remove the meat from the bag and discard the marinade. Dry the steak well with paper towels and bring it to room temperature. Heat a large skillet over high heat, about 2 minutes. Rub the steak with the remaining 1 tablespoon of olive oil. Sprinkle 1 tablespoon of salt over the surface of the pan; add the meat and set a heavy skillet on top to weigh it down. Sear the steak for about 7 minutes; turn the steak, replace the weight over the steak and cook until a thermometer inserted into the side of the steak registers 110 degrees for medium-rare, about 5 minutes. Transfer the steak to a cutting board, brush with some of the herb butter, tent with aluminum foil and allow the steak to rest for about 10 minutes. Thinly slice the steak against the grain and top with more of the herb butter. 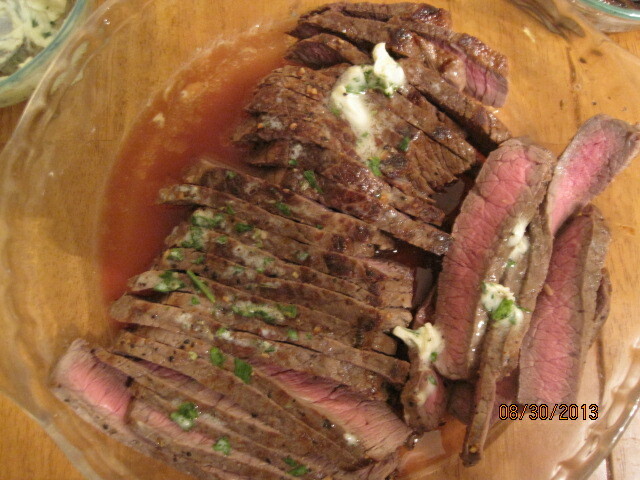 The herb butter adds a really nice flavor to the steak and the marinade is tasty but not overpowering at all. You want to make sure that you don’t overcook this cut of meat. It gets very chewy pretty quickly, even if you marinade to help break the meat down some before cooking. I actually added 1 tablespoon of Montreal steak seasoning and rubbed it into both sides of the steak before cooking just to get some extra flavor and it was great. I served this steak with mashed potatoes, some mixed vegetables and I whipped up some caramelized onions right in the pan I had cooked the steak in. Add the sliced the onions to the pan you cooked the steak in along with the beef broth. Turn the heat to high and scrape up any browned bits on the bottom of the pan. Cook until the onion is softened, about 3 minutes. Add the balsamic vinegar and stir, allowing to cook down, about 1 minute. Add the butter to the pan and swirl to melt and coat the onions. It’s a quick little side dish that makes up some great onions. You can try it anytime you cook any type of beef or change things up and use chicken broth when you make some chicken. That’s all I have for today. Check back next time to see what recipe comes along. I am starting to plan some things out for next week so check and see what I decide to make. Until next time, enjoy the rest of your day and enjoy your meal! I am always on the lookout for quick weeknight meals that taste great. Sean had requested we have tacos for dinner a few nights ago. 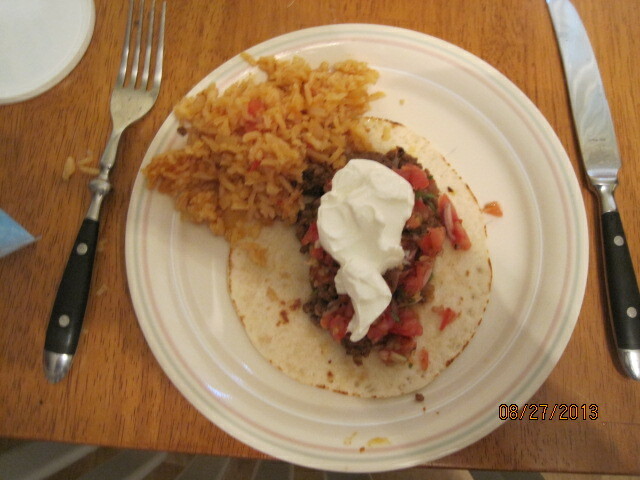 I like to make taco dinners because they are simple to make and clean up from and always taste great. The nice things about tacos are that, like fajitas, you can use any protein you like best for your main component. I have made and posted fish taco recipes before, but this time I thought I would keep it simple and use the ground beef we had on hand to make some beef tacos using this recipe from America’s Test Kitchen. Heat the vegetable oil in a medium skillet over medium heat until shimmering. Add the onion and cook until it is softened, about 5 minutes. Stir in the garlic, spices, and 1 teaspoon of salt and cook until fragrant, about 30 seconds. Stir in the ground beef and cook, breaking it up with a wooden spoon, until it is no longer pink,about 5 minutes. Stir in the tomato sauce, broth, vinegar and brown sugar and simmer until the mixture is thickened, about 10 minutes. Season with salt to taste. Divide the filling evenly among the taco shells and serve, putting out any toppings or accompaniments that you wish. If you have ever bought any of those packaged taco kits, you know that they come with a seasoning packet. Perhaps you have even bought a packet separately to use to make tacos. Do yourself a favor and just use the spice mix listed here in this recipe. It tastes a lot better than anything you will buy. Also, instead of adding the water like the packet asks you to do, you can add the tomato sauce and broth used here and get much better results and flavor. I always serve tacos with some homemade salsa, sour cream, shredded cheese and lettuce for toppings. Very often I also have guacamole to serve as well, which I did not have this time. I made some Mexican rice to go along with it, which makes an excellent side dish for tacos. That’s all I have for today. it’s just a simple and quick recipe today. 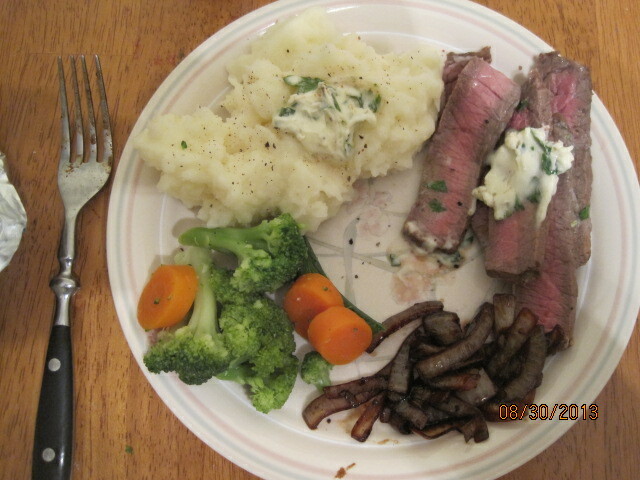 Check back next time as I will have a recipe for london broil with herb butter that sounds pretty tasty. I also hope to have some other recipes this weekend that I have been promising to make but just haven’t had the time to get to yet. You’ll want to check back for those as the lemon icebox pie looks great and I am anxious to try making the ciabatta bread. Until then, enjoy the rest of your day and enjoy your meal! Bring Your Lunch to Work – NYTimes.com. There’s a great article in the New York Times Dining section today about bringing your lunch to work. So many people opt for buying lunch, spending a lot of extra money that you can save simply by making a couple of things early in the week or on Sunday while watching TV that can give you great tasting lunches for the rest of the week. Check out this article and see some of the ideas it has for you. 25 Quick and Easy School Lunches to Pack for Your Kids – Bon Appétit. Michelle was late last night so I ended up just making pizza for Sean and myself, so I have no new recipes to post today. However, I do have this re-blog from Bon Appetit. For many people, the school year has already started and for others it is right around the corner. If you are like me, you are always on the lookout for something to try for a quick lunch for your child. Bon Appetit has put together 25 great ideas for quick and easy school lunches that you can try. Check it out! New recipe for tomorrow! As fun as vacation was. it is always nice to be back home. It also means it’s back to the kitchen for some cooking, which I did for the first time in a week last night. Anyone who is my age remembers the Brady Bunch episode where Peter talked about pork chops and applesauce. They seem like a perfect pairing and since I had picked up some early season apples and some pork chops yesterday when shopping, it made for the perfect dinner last night. Pat the pork chops dry with paper towels then season them well with salt and pepper. Heat the 2 teaspoons of oil in a large skillet over medium-high heat until just smoking. Brown the pork chops on the first side, about 3 minutes. Flip the chops over and reduce the heat to medium. Continue to cook the chops until the center of the chops away from the bone registers 135 degrees on an instant-read thermometer, about 5 to 10 minutes. Transfer the chops to a clean plate and tent with foil, allowing the pork chops to rest until the pork reaches an internal temperature of 145 to 150 degrees before serving, about 5 to 10 minutes. While the pork chops rest, add the remaining 1 tablespoon of vegetable oil and return the skillet to medium-high heat until the oil shimmers. Add the shallot and cook until it is softened, about 2 minutes. Stir in the bourbon and the apricots, scraping up any browned bits still in the pan. Add the chicken broth and the thyme and simmer until the mixture is thickened, about 8 minutes. Stir in any accumulated pork juices from the plate the pork has been resting on and the red wine vinegar. Season with salt and pepper to taste. Spoon the sauce over the pork chops before serving. The pork was cooked perfectly and this pan sauce was great. I really like the flavor you get from the apricots and bourbon and the vinegar gives it just that hint of bite and acid. it’s a very simple meal that you can make on a weekend or a weeknight with little effort at all. Now for the applesauce. Everyone has their own version of the applesauce thhey make, often passed down through families. Applesauce itself is pretty basic to make and all I did was follow America’s Test Kitchen recipe for a very simple sauce. Combine the apples, water, sugar and salt in a large Dutch oven. Cover and cook over medium-low heat, stirring occasionally, until the apples begin to break down, about 15 to 20 minutes. Mash the cooked apples with a potato masher or against the side of the pot with the back of a wooden spoon. Season with extra sugar or add more water to adjust the consistency to your own liking. Add the cinnamon to the sauce and mix well. Serve warm or cool to room temperature, about 1 hour. You can make the applesauce as chunky or smooth as you like it or even run it through a food mill instead of mashing it if you have a food mill. 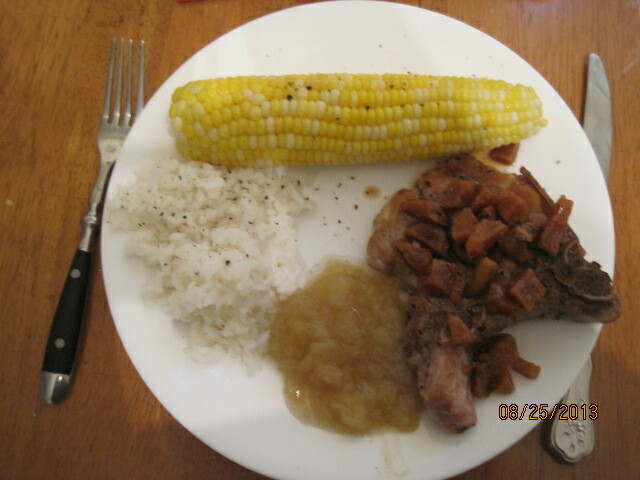 We all like the cinnamon in the applesauce, but you could just as easily leave it out if you prefer just the great apple flavor on its own.I also made some plain white rice and xorn on the cob to round out the meal. That’s all I have for today. Check back next time for more recipes. I do have some things planned for this week that I didn’t get to before I left on vacation, such as the lemon icebox pie, the ciabatta bread and a few other recipes. Keep checking back to see what is next. Until next time, enjoy the rest of your day and enjoy your meal! Our Best Breakfast How-To’s | Food Republic. Sure, we all make breakfast all the time,but if it is not something you do a lot, even the basics can seem a bit out of reach. Food Republic goes over some basic breakfast how-to’s in this post, like scrambled eggs, sausage and bacon. It’s worth a look and they have some new recipes too. I’ll be back later today with a regular blog post now that I am back from vacation. Check it out! How to Buy, Store, and Cook Garlic, In Season in August – Bon Appétit. This is the time of year when you will find great heads of garlic at your local farmer’s market. Bon Appetit has a nice little article here about what you should look for when buying some garlic and how best to store it to get the most out of it. Check it out!